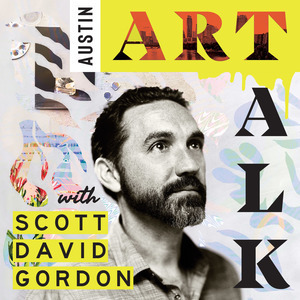 61 episodes of Austin Art Talk Podcast since the first episode, which aired on October 14th, 2017. This is bonus content from the interview with Flip Solomon Episode 12. The first inspiring story is about Lek Chailert who with the help of many others saves and rehabilitates hundreds of animals in Thailand. The second story is of a dream that inspired a drawing and created a connection. If you haven't listened to Flip's main interview please go back and check that out first. Thanks! If you had a neurological disorder that caused you to sleep more than normal and have vivid and intense dreams you might think of that as a serious problem with no upside. But for Flip Solomon it has become the source of her artwork in which she explores timeless themes and symbols with a goal of healing and connecting people on a basic, fundamental level. Hear her story and consider how you might look at your own problems as solutions. Episode 9: Hayley Gillespie - Art.Science.Gallery. The intersection of art and science might not be obvious at first glance but the two are actually very intertwined and have been for 100's of years. From the drawings and studies of Da Vinci and Charles Darwin to modern day illustrations of black holes, art as a way to imagine, interpret, and convey the ideas of science has never been more relevant. And Dr. Hayley Gillespie, founder of Austin's Art.Science.Gallery. is for me the best person to explain Science Art and share stories of scientists who were and are also artists and what it's like to run a gallery and support artists in this city. Yuliya Lanina is a multimedia artist who creates paintings, animations, music videos, animatronic sculptures, and performances, and often works on collaborations with composers, technicians, and choreographers. She is also a lecturer at UT and since moving to the US from Russia as a teenager has created a very successful career. Voted Best Visual Artist of 2017 through a readers poll in the Austin Chronicle, Paloma Mayorga is an artist, curator, and has worked in arts administration since graduation from college. Her work is subtle but evocative and attempts to inspire and continue the conversation about women's issues and how we can all heal and empower others. Steven Walker, the owner of Modern Rocks Gallery, shares about his life leading up to moving to America, and the past almost four years selling rock photography and rocks in the live music capital of the world. What happens when you go from being a dancer to making a living as an artist? How do you move to a new city and start over? Join me for a delightful talk with Austin graphic artist Emily Galusha to get the answers and hear about her life in art starting as a child to being more fulfilled than ever with her work and path. A funny and enlightening interview with Austin figure painter Patrick Puckett, who is represented locally by the Wally Workman gallery. The executive director of Big Medium shares how that organization got started, it's mission, in addition to the history of the East Austin Studio Tour, WEST, and the Texas Biennial. We also talk about his beginnings in art and a new project that could standardize through collaboration some essential resources for artists and their businesses. Such a delightful and informative conversation with Troy Campa of CAMIBAart Gallery, located in the Flatbed Building. From architecture to art gallery, we talk about Troy's career shift from being an architect to selling art full time for three years and all that he has learned. A wide ranging conversation with gallery owner and Austin historian Stephen L Clark about how he got started, the many people he has met along the way, selling art, and what it has been like to run a photography gallery in Austin for almost 25 years.